If there’s one change I hate about IIS 7 and beyond, it is the lack of the very useful IISAPP script that was present on IIS 6 installations. Run it from a command prompt, and you will see a list of all running worker processes, the process id and the application pool name the process is serving. Very useful if you need to shut down a single site. As I mentioned, that script was removed in IIS 7 and beyond. I find myself constantly running IISAPP without any luck several times a week, and I’ve decided that this is a habit that I cannot leave behind. And now my day got a whole lot better. Since the BAT file was copied to the System32 folder, there’s no need to add anything to the PATH environment variable. 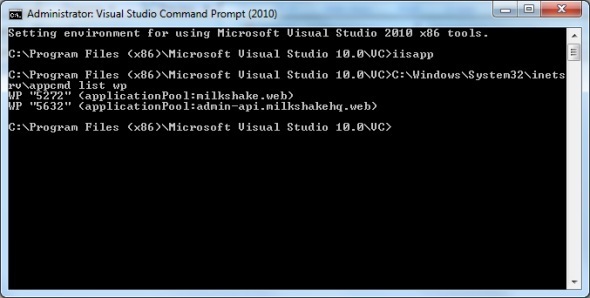 This will work from any command prompt – just type iisapp and hit Enter.